Large, deep-pink, semi-double flowers from February to April. Vigorous, bushy growth. Originally taken from Japan to The Channel Islands in 1869 and renamed as 'Lady Clare', but now known under its original Japanese name. 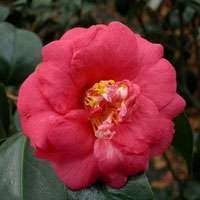 I have recently received from Trehane a beautiful, strong Camellia japonica Akashi-Gata. The leaves look immaculate. This is the 4th Camellia from Trehane and the 'Donation' which I planted end of January still has a flower.